1966 was a momentous year for the UK. 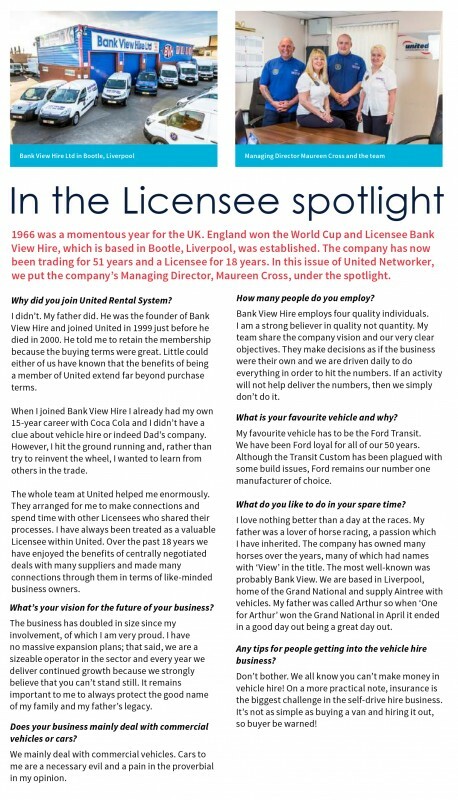 England won the World Cup and Licensee Bank View Hire, which is based in Bootle, Liverpool, was established. The company has now been trading for 51 years and a Licensee for 18 years. In this issue of United Networker, we put the company�s Managing Director, Maureen Cross, under the spotlight. Why did you join United Rental System? When I joined Bank View Hire I already had my own 15-year career with Coca Cola and I didn�t have a clue about vehicle hire or indeed Dad�s company. However, I hit the ground running and, rather than try to reinvent the wheel, I wanted to learn from others in the trade. processes. I have always been treated as a valuable Licensee within United. Over the past 18 years we have enjoyed the benefits of centrally negotiated deals with many suppliers and made many connections through them in terms of like-minded business owners. What�s your vision for the future of your business? The business has doubled in size since my involvement, of which I am very proud. I have no massive expansion plans; that said, we are a sizeable operator in the sector and every year we deliver continued growth because we strongly believe that you can�t stand still. It remains important to me to always protect the good name of my family and my father�s legacy. Does your business mainly deal with commercial vehicles or cars? We mainly deal with commercial vehicles. Cars to me are a necessary evil and a pain in the proverbial in my opinion. Bank View Hire employs four quality individuals. I am a strong believer in quality not quantity. My team share the company vision and our very clear objectives. They make decisions as if the business were their own and we are driven daily to do everything in order to hit the numbers. If an activity will not help deliver the numbers, then we simply don�t do it. What is your favourite vehicle and why? My favourite vehicle has to be the Ford Transit. We have been Ford loyal for all of our 50 years. Although the Transit Custom has been plagued with some build issues, Ford remains our number one manufacturer of choice. I love nothing better than a day at the races. My father was a lover of horse racing, a passion which I have inherited. The company has owned many horses over the years, many of which had names with �View� in the title. The most well-known was probably Bank View. We are based in Liverpool, home of the Grand National and supply Aintree with vehicles. My father was called Arthur so when �One for Arthur� won the Grand National in April it ended in a good day out being a great day out. Any tips for people getting into the vehicle hire business? Don�t bother. We all know you can�t make money in vehicle hire! On a more practical note, insurance is the biggest challenge in the self-drive hire business. It�s not as simple as buying a van and hiring it out, so buyer be warned!